Madame Handley-Seymour designed this pale grey costume for the actress Mrs Patrick Campbell to wear on stage as Eliza Doolittle in Act V of Pygmalion (produced 1914) by George Bernard Shaw. Elizabeth Handley-Seymour was one of the leading London fashion houses of the 1910s, 1920s and 1930s. She created costumes for a number of actresses and theatrical productions in addition to catering to aristocratic clients and members of the Royal Family, and is best known as the designer of Queen Elizabeth the Queen Mother's wedding dress. This design is particularly interesting because it is based on a design by the avant-garde French couturier Paul Poiret which is included in another of Handley-Seymour's albums dated 1911. (see E.375-1958). While the colours and basic silhouette are the same, Handley-Seymour has modified Poiret's original design to bring it up to date for 1914 and also simplified some of the design elements. She has shortened the jacket sleeves to elbow length, extended the contrasting black hip darts on the skirt waist into corresponding bust darts on the bodice, and replaced a ruffle and low-slung belt with a single black and floral patterned waistband. Despite these changes the outfit remains recognisably based on the original design. While Poiret's suit might have been considered quite startlingly graphic and extra-fashionable for 1911, by early 1914 it would have been considered extremely smart but not so modern as to be outrageous. 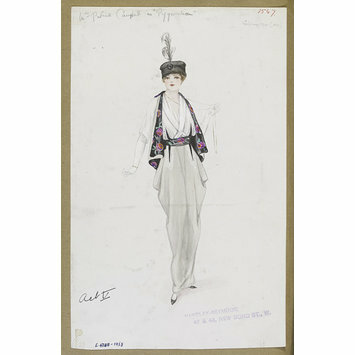 Design for Mrs Patrick Campbell to wear as Eliza Doolittle in Pygmalion. Grey flared jacket lined with contrasting black lining patterned with pink roses, elbow length sleeves, draped peg-top skirt with wide black waistband patterned to match lining of jacket. Toque hat with upstanding feather. 1 of a set of 276 designs mounted in 3 volumes for costumes worn on the stage by Mrs. Patrick Campbell, Dame Irene Vanbrugh, D.B.E., Miss Diana Wynyard, C.B.E., and other actresses in London productions. Madame Handley-Seymour. 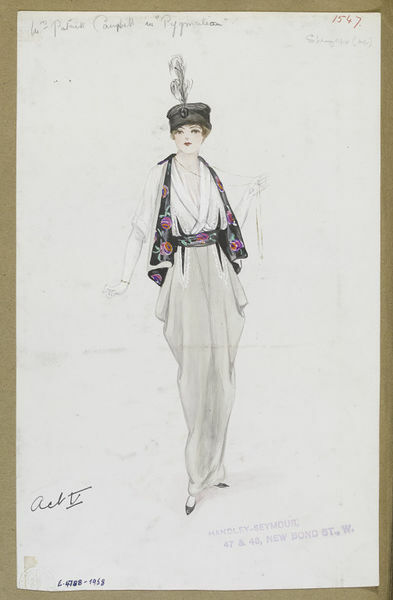 Design for Mrs Patrick Campbell to wear as Eliza Doolittle in Pygmalion (1914). Based on a Paul Poiret suit (see E.375-1958). D. Milford-Cottam, Edwardian Fashion, United Kingdom, Shire Publications, 2014.